Thailand is one of the globally recognized sources of fine quality silk and related products. Thai silk fabrics especially have brought good reputation to the country as well as have been accepted and recognized among national and international consumers. Thai silk fabrics are uniquely distinguished by their distinctive beauty, consummate craftsmanship, soft and smooth texture, iridescent sheen, attractive designs and colours which make it different from silk fabric produced elsewhere. For the modern sericulture development, it is fully supported by Her Majesty Queen Sirikit. In the Year 2003, the Cabinet agreed to establish The Queen Sirikit Institute of Sericulture was formed by merging two sericulture related offices, i.e., Sericulture Research Institute of the Department of Agriculture, and Sericulture Promotion Sub-Division of the Department of Agriculture Extension, and in the year 2009, the Queen Sirikit Department of Sericulture was officially established on the fourth of December 2009 under the Ministry of Agriculture and Cooperatives in order to undertake systematic and complete operation to fulfill the initiatives of Her Majesty Queen Sirikit. 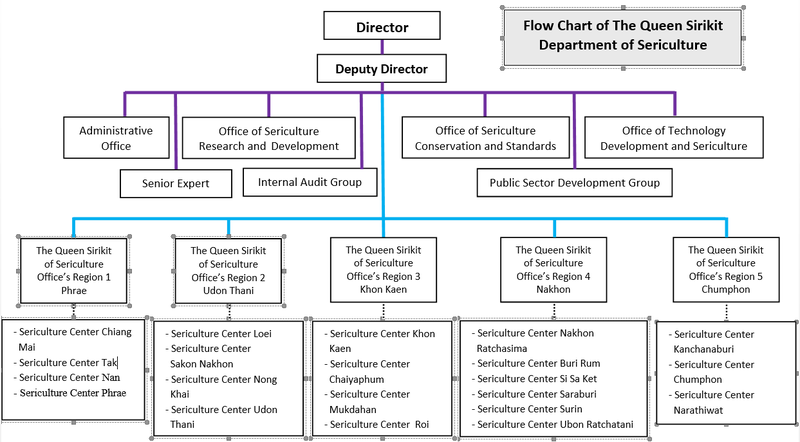 The Department consists of a Director General and two deputies, internal audit team and administration system development team reporting directly to the Director General, and 4 functional offices, comprising of Office of General Administration and Office of Sericulture Research and Development which is in charge of conducting research and development for silk throughout, from the beginning until the end of the processes such as developing hybrid Thai silkworm breeds and appropriate silkworm breeds for specific areas in order to have strong silkworm breeds with high productivity as accepted by farmers, conducting research on full scale silk spinning machine for producing high quality silk thread that help to save time and manufacturing cost of farmers, conducting research and development on mulberry and silkworm breeds using both conventional method and bio-molecular technique, conducting research and development to create value added products from sericulture such as health food made from mulberry fruit and silk cocoon or cosmetics from silk protein, and initiating hand woven product models to promote uniqueness of Thai Silk product. Office of Sericulture Conservation and Standard Conformity Assessment is responsible for conserving and cultivating mulberry, silkworm and dye plant species and distribute them to farmers across the country, conserving Thai silk and local sericulture wisdom in various forms as well as creating database on Thai Silk pattern, to be used as educational material in silk weaving for younger generations, establishing silkworm breeds bank, and Sericulture Knowledge Center. The last one is Office of Sericulture Development and Technology Transfer which takes care of transferring mulberry and silk production technology to farmers such as bleach-dyeing, product processing and also silkworm raising technique, promoting and developing full cycle sericulture career, and upgrading standard of manufacturing in silk industry network, helping to create 30 joint ventures between local network and private sectors and helping to develop more than one thousand farmers. There are 5 Regional Offices in 5 provinces namely, Phrae, Udonthani, Konkaen, Nakorn Ratchasima and Chumporn. The regional centers are in charge of 21 Sericulture Centers situated across the country. Agriculture is the foundation of Thailand’s economy. Approximately, 54 per cent of the total population (69 million) is engaged in this sector. Of the country’s total area of 51.36 million hectares, about 46 per cent is under cultivation. The land, both irrigated and non-irrigated, is used by some 5.3 million farm families producing agricultural goods for domestic consumption and export. Sericulture is a traditional and cultural way of life of the Thai people. In 2013, sericultural practices covered 57 out of the total 77 provinces with the total mulberry planting area of 16,977 hectares. The approximate number of farmers who engaged in sericulture were 101,000, most of whom (80%) lived in the Northeastern part of Thailand. Most farmers are of small-scale who practise sericulture as a supplementary occupation apart from paddy field. Silk production in Thailand can be divided into two categories depending on whether the yarn is reeled by hand or by machine. Hand-reeled yarn is produced on the farm using relatively simple equipment; farmer may sell their hand-reeled yarn to factories or weave it themselves to produce fabric in traditional styles. Production is based on native ‘polyvoltine’ silkworm varieties that give low yields but are tolerant of local conditions and are therefore relatively easy to rear. Some new ‘Thai hybrid’ silkworm varieties have been developed which are more productive and which preserve the ‘lustrous’ character of traditional Thai silk. In the case of machine-reeled yarn, the farmers produce and sell cocoons and the yarn is reeled in factories. The silkworms are ‘bivoltine’ varieties which are highly productive but require higher levels of skill and care than polyvoltine or ‘Thai hybrid’ varieties. In general, farmers who produce cocoons for machine reeling have larger mulberry holdings and produce at a larger scale than the hand-reelers. However, there are no fixed barriers between the two sub-sectors; farmers may rear ‘Thai hybrid’ varieties for hand-reeling during some production cycles and switch to import ‘bivoltine hybrid’ varieties for sale to factories in other production cycles each year. Thailand’s domestic production during the year 2013, was 660 tons, comprising of 500 tons of hand reeled yarn, and 160 tons of machine reeled yarn, whilst the imported silk yarn was about 156 tons. In Thailand, the mulberry cultivation practices were widely of low yielding local varieties. The Queen Sirikit Department of Sericulture has presently introduced new varieties, namely Buriram 60 (BR60), Buriram 4/2 and Sakolnakhon, to replace the farmer’s low yielding varieties. These 3 varieties can provide 18.75 – 25 tons per hectare per year. Other 2 mulberry varieties found in Thailand are native ones. Noi and Khun Pai varieties provide 12.5 – 15.6 tons per hectare per year. Generally, the mulberry plantations are renewed once every 10 years, by extracting the old trees and planting new ones (The reason is that the trees are harvested very intensively under the tropical climate, resulting in their exhaustion). To promote these varieties, the Queen Sirikit Department of Sericulture has organized production of saplings at Queen Sirikit Sericulture Centers. The process starts with preparation of hardwood cuttings, planting them in plastic bags stuffed with soil and growing for 4 months. After that, the Center gives the saplings to selected farmers free of charge. These farmers take the obligation to supply cuttings to other farmers free of charge. The Department also promotes village nurseries where the farmer groups produce planting material from these varieties by themselves. The tropical climate in Thailand is also favourable for planting the cuttings directly in the field in order to establish new plantation. The mulberry plantations in Thailand are bush type, with about 1.5 meters spacing between rows and 0.75 meter between plants. Common practice is the mulching of the inter-row during the dry season (January – April). Usually, the traditional farmers bottom prune the mulberry trees once a year. For the other crops, they just pick up the leaves from the trees. In Thailand, the popular mulberry products are mulberry leaf tea and mulberry fruit juice. We have developed Chiang Mai variety for mulberry fruit as well. There are three main types of silkworm varieties used in sericulture: native variety, Thai hybrid varieties (polyvotine x bivoltine), and bivoltine hybrid. The first two varieties are mainly used for hand-reeling, whereas the bivoltine hybrid is for machine reeling. Silkworm rearing methods in Thailand are handmade silk yarn and Industry silk yarn. Handmade silk yarn is based on local wisdom techniques compiled with new technology. Most of the sericulture farmers rear silkworm as an additional career to create supplementary income. This silkworm rearing is normally found as domestic activity in farmers’ families and to be made better life. For industrial silk yarn production, commercial silkworm rearing is conducted by farmers as their main career. They are members of the company or silk reeling firm, where they have to sign the contract between each party. They should have the required infrastructure and mulberry cultivation area not less than 0.4 hectare. The 4 types of Royal Peacock Mark are Golden Peacock, Silver Peacock, Blue Peacock, and Green Peacock. The term refers to the type of Thai silk that is hand woven weft and warp using indigenous Thai silk thread picked by hands on traditional handlooms. This refers to the style of Thai silk that is hand woven vertically and horizontally using either indigenous or adaptive Thai silk thread picked by hands on traditional handlooms. Silk threads reeled by hand or equipment with motor not exceeding five horsepower. Only pure silk thread is used in this kind of silk, which is woven vertically and horizontally on any kind of loom. For this kind of silk, pure silk thread is the main component, supplemented by other fibers as secondary raw material. Any kind of loom can be used but details of fiber components must be clearly identified. All kinds of silk must be environment-friendly, dyed with either natural or chemical color, and produced in Thailand. The main function of The Queen Sirikit Department of Sericulture is to support farmers with technical knowledge in the field of raw silk production, processing and marketing of silk cottages. The strategy of the department is to increase the production of domestic yarn to support silk handcraft cottage industry. The second major aim of the strategy is the promotion on high quality silk yarn at community level. to produce silkworm egg particularly Thai and Thai-hybrid varieties and mulberry cutting/sapling to serve farmers in the project area. Construction of low cost silkworm rearing house/rooms have proved to be effective in maintenance of hygiene, optimum temperature, good ventilation and control of the uzi fly infestation. Therefore, the farmers can easily get used to new rearing technology. This is done by encouraging and promoting young silkworm rearing system in the village through young silkworm rearing group. This farmers’ group is in charge of young silkworm rearing for a certain time and then distribute young silkworm (generally at first day of 3rd instar) to the members of the group. In this system, farmers can increase their cocoon production through increasing the number of crops per year. Demonstration plots have been kept at Queen Sirikit Sericulture Centers and sericulture villages. Farmers can learn new technologies such as plantation method, pruning, soil management, cultivation, control of pests and diseases and plant protection measures. Improved technology on hand reeling of weft silk yarn by using reeling tools can produce better raw silk better than native hand reeling. These types of reeling tools can increase the quantity and quality of silk yarn compared to the traditional hand reeling. Technology of degumming and dyeing technique especially natural dyeing has been improved and transferred to farmers in order to improve quality of silk products. In order to strengthen farmer groups, all stakeholders of silk production in the supply chain are encouraged to coordinate and connect together. So, they can support and exchange their knowledge and products within the cluster. Farmer group in the concentrate area of Thai hybrid cocoon production should operate the community reeling plant by itself. This system is promoted and supported by the government. The cocoon producers are the members or networks to support Thai hybrid (polyvoltine into bivoltine) cocoon supply to community reeling plant, and then they can operate their silk yarn production according to cocoon production’s plans. The simple reeling machine is classified as multi-ends reeling machine, which applies motor less than 0.5 H.P. in the process. Fresh cocoons are bought by members before sorting defected cocoons from good cocoons. The cocoons are then boiled and the outer layer is removed by hand reeling tool to make silk yarn grade 3. The cocoons are boiled further in a separate boiling pot at preparation stage. The cooked cocoons are put into stand by basin adjacent to reeling basin before starting the process of end groping. Two reelers stand and operate reeling machine during the process of end groping and cocoon feeding. Silk yarns in reels are re-reeled and processed in stand skeins before selling to market as grade 1. This kind of silk yarn can be marketed as hand woven. Unreelable cocoons left in the basin will be taken for hand reeling to obtain grade 3 of silk yarn. After completion of reeling process, all fresh pupae are sold to market as human food. Generally, the price of silk yarn grade 1 which is produced from this reeling machine is always 10-20 % higher than hand reeled yarn. Private sectors are encouraged to participate in the joint agricultural development projects implemented by the four sectors, which are government agencies, private sector, financial institution, and farmers. This is in line with the plan of the Ministry of Agriculture and Cooperatives to coordinate and collaborate with the four sectors in carrying out agricultural and agro-industrial development projects. Since, there are legal and illegal importers of silk yarn and synthetic yarn from other countries, silk yarn used for making fabric happens to be either good or defective. Consequently, though still labeled as Thai silk fabric for domestic and international commercial purpose, its quality remains inferior. This situation decreases consumer’s trust in Thai silk products. Her Majesty Queen Sirikit has worried about this matter, and then HM the Queen gave the Royal Thai Fabric Certification Mark, called Royal Peacock Mark for 4 types of Thai silk fabric to prevent the forged Thai Silk Label. This certification mark can be used in Thailand and international market.